THNX!! Glad you like it. This is an ok theme. However it could have been much much better. I welcome criticism, but it would be more productive and beneficial if critics gave reasons for criticism and/or suggestions to improve theme, rather than just say it could be better. I appreciate people taking the time to comment. It aids in getting an idea for what people like and don't like. I am new to making themes, so I can use all the input I can get. if you could make this theme accesible for more resolutions it would be great. i need it for 1280x1024, but also other res are welcome. There are 2 other resolutions of this theme at my DeviantArt Gallery. Please go to link below to get latest version of this theme. It is possible to get a 1024x768 version of this very nice Style??? THANKS!!! Glad you like it. Sorry you are having problem jose. 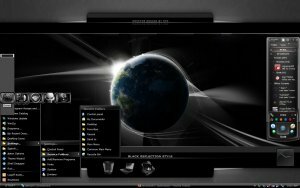 After you unzip the downloaded .zip file, there is a Readme file, an Extra Desktop Icons folder, a Left Panel Icons folder and a file named "Black Reflection Redo-1680.atz". You need to copy and paste the "Black Reflection Redo-1680.atz" file according to the directions in the Readme. For aston 2 a new theme is possible?